Replace the worn-out roller on your boat trailer with this heavy-duty rubber one. This bow roller functions as a direct replacement for rollers that fit standard 3" wide brackets with a 1/2" diameter shaft. 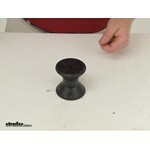 Call 800-298-8924 to order Yates Rubber boat trailer parts part number YR3143-4 or order online at etrailer.com. Free expert support on all Yates Rubber products. 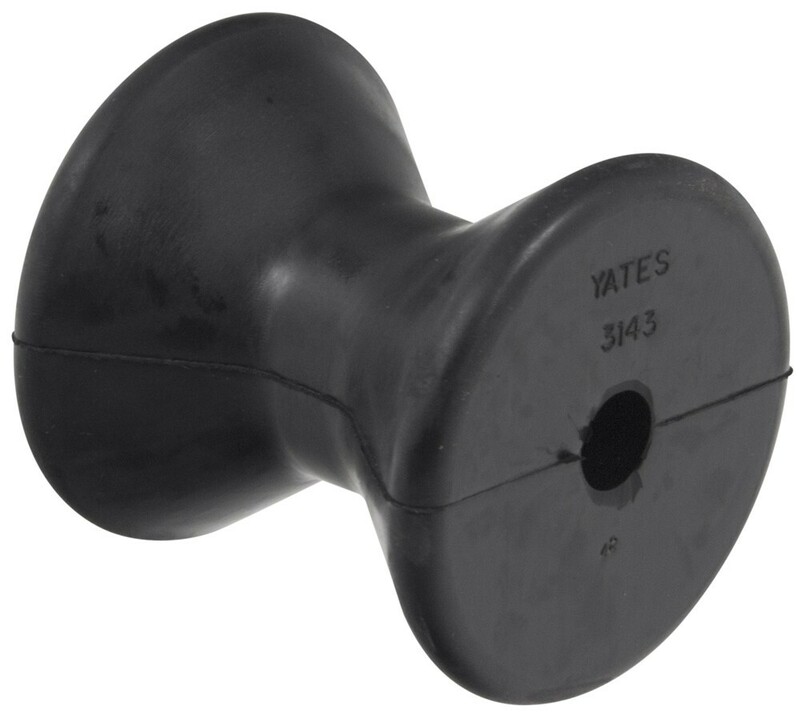 Guaranteed Lowest Price and Fastest Shipping for Yates Bow Roller for Boat Trailers - Heavy-Duty Rubber - 3" Long - 1/2" Shaft. Boat Trailer Parts reviews from real customers. Replace the worn-out roller on your boat trailer with this heavy-duty rubber one. This bow roller functions as a direct replacement for rollers that fit standard 3" wide brackets with a 1/2" diameter shaft. Replace the standard rubber bow roller on your boat trailer with this yellow thermoplastic rubber version from Yates. TPR material is stronger than rubber and softer than polyurethane, and it won't leave marks on your boat. This roller assembly supports your boat's keel for easy loading and safe transport on your trailer. It features a 5-inch, black rubber spool roller and a galvanized steel bracket that attaches to your trailer's tongue. Roller Shaft with Pal Nuts for Boat Trailer Rollers - Zinc-Plated Steel - 5-1/4" x 1/2"
Today we're going to review part #yr3143-4. 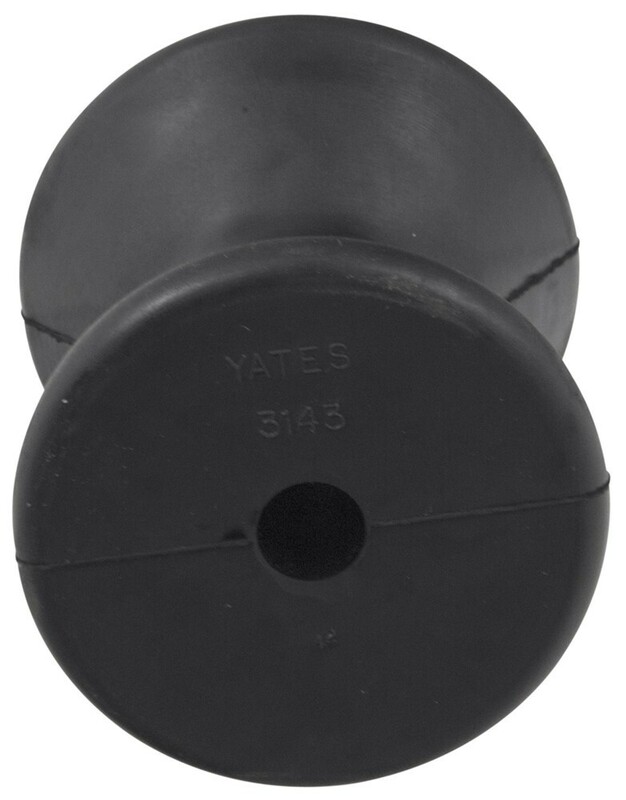 This is a Yates bow roller for boat trailers. This roller is constructed of a heavy duty rubber compound. It is made in the USA. 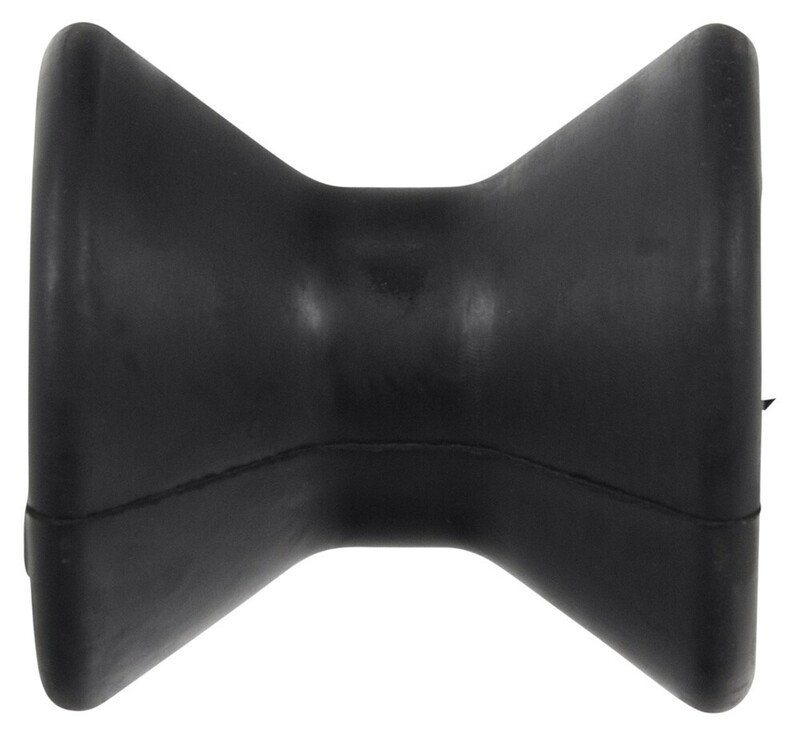 This roller will replace the worn out bow roller on your boat trailer it does help in loading and unloading of the boat and it does support the front of the boat as it sits on the trailer. It also helps to absorb the road shock while the boat is being towed. I'm going to do a few measurements on this. The length of this roller is 3 inches. The diameter is also 3 inches and this roller is designed to fit on a 3 inch wide bracket that will use a half inch diameter shaft. And that should do it for part #yr3143-4. Order: RelevanceNewestRating - High to LowRating - Low to High Replace the worn-out roller on your boat trailer with this heavy-duty rubber one. This bow roller functions as a direct replacement for rollers that fit standard 3" wide brackets with a 1/2" diameter shaft. All is still good, thanks for taking the time to check in. No problems. Still like new! My boat is still a work in progress, so I havent had a chance to use the product yet, but I did try it out and it worked just fine. Looks like you have the part # YR450BLK-400BLK installed and are needing the next size down which happens to be the part # YR300BLK-325BLK. This fits the same 1/2 inch diameter shaft but is 1 inch shorter than what you have. Your bell ends being deformed would not be a good sign. We do offer 3-inch bow rollers and all can be seen on the linked page. These are offered in various materials including basic black rubber like # YR3143-4 and non-marking thermoplastic compounds like part # YR300B. All fit on a 1/2-inch shaft like the one included in CE Smith Keel Roller Assembly # CE32003G. To select the correct Bow Roller or Bow Guard, see links, for your Tidewater boat trailer, you will need to measure to determine the proper size. The width of the roller and diameter of the shaft that the roller installs on will be needed. Most boats that use a roller use the 3 inch Rubber Bow Roller, # YR3143-4, that you referenced, at the point closest to the trailer winch. This roller accepts a 1/2 inch diameter shaft. The 3 inch bow roller # YR3143-4 takes a 1/2 inch diameter shaft such as # CE10700A. The Pal nuts are included. The length of this shaft is 5-1/4 inches long so you may need to trim it down a little. The cut will need to be straight and smooth so the Pal nuts will still fit on the ends. If a bracket is needed as well we have numerous options. I have included a link to them for you. Typically, you would need a Bow Roller, part # YR3143-4. Then, you would also need keel rollers, part # 804 or part # 805. Additionally, you will need the appropriate brackets to attach the rollers, which are listed along with the rollers themselves. You can view all available boat rollers and roller parts we offer online.